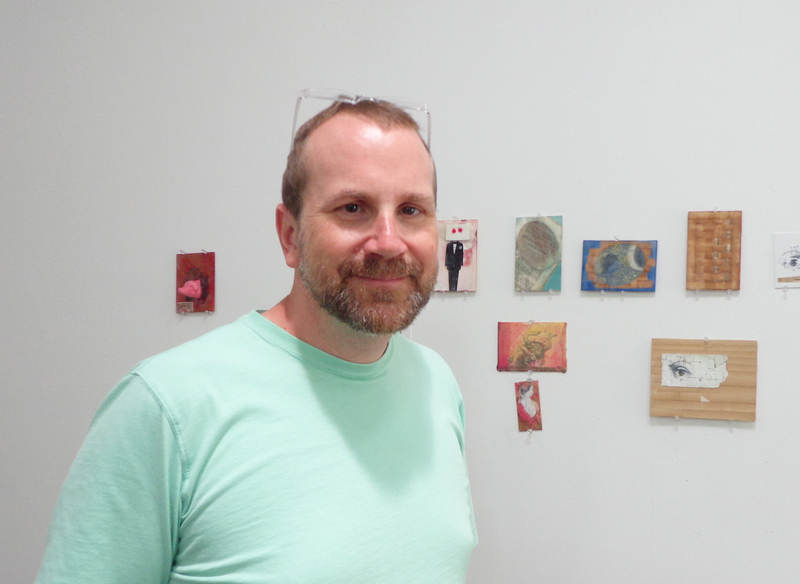 New materials and old collide in Mitch’s mixed media assemblages. His collections of old books, bird nests, and bones line the floor and tables while new stickers, scrapbooking paper and decorative tapes are pinned to the opposite wall, on display to be easily selected and applied to new work. Some of the materials he arrived with, others he has collected from the many antique shops and junk stores in Paducah. He cuts apart the books, searching for interesting images. Aged, brittle pages produce interesting textures and colors that are carefully extracted to preserve their importance. Some of the images he scans to set them aside to reuse again. 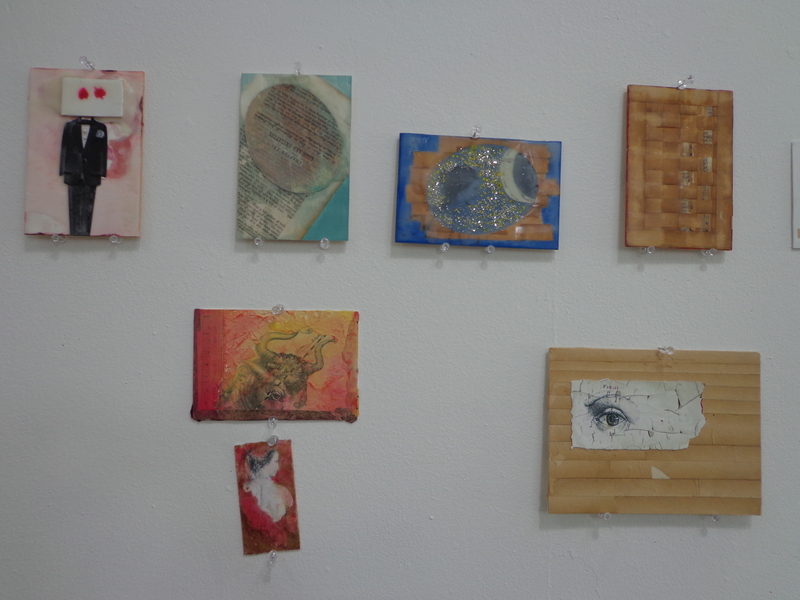 Several small works are in progress on the table and more complete works are pinned to the wall to view. Having many pieces going at once allows him the flexibility to move from one piece to another and respond intuitively to the available materials. 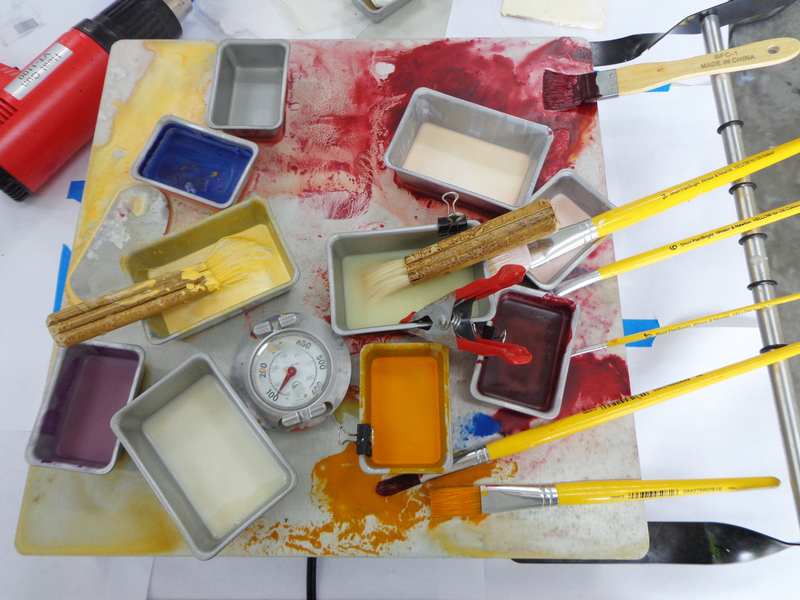 Mitch has also used the time here to work with encaustic, a new material for him. The translucent materials add color and dimension to his compositions, suspending collaged materials layers over the images. 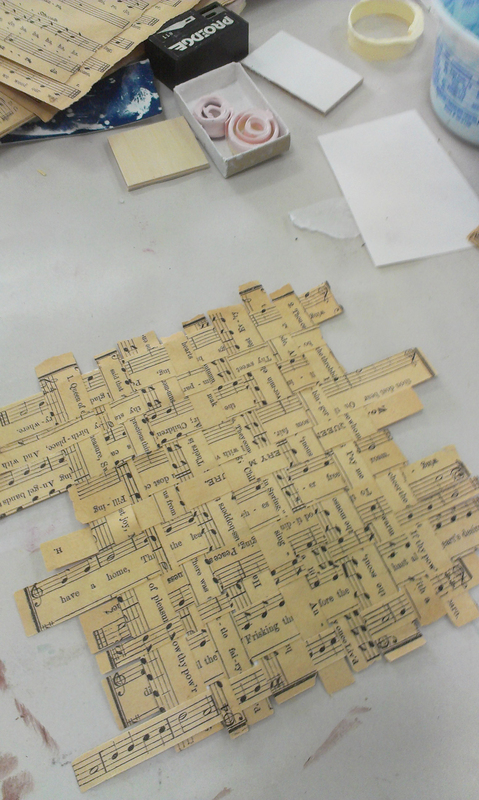 After visiting the National Quilt Museum, Mitch has been busy cutting small strips of paper and weaving them together. The works are not pieced, but provide a similar visual result of individual squares and rectangles relating with one another to create a new surface. He enjoys learning from the craft traditions and playing in the open space that A.I.R. Studio offers. His past work focused on still life photography based in a Dutch tradition. He is captivated by making arrangements that are not permanent, and the ability to rearrange objects into something new, documenting through photographs. His interest in the staged experiences of natural history museums and gardens play into his current work. Mitch is the Associate Professor of Photography at the University of Louisville. He received his M.F.A. from Ohio University.